Looking for a decent typing software for the typing test preparation of the IA(Informatics Assistant) exam 2018 your search is finished. In this post I will tell you about the software which can make you successful in this typing exam and make your journey easy for the sure success. Before going directly to typing software first I would like to tell you about the pattern of IA typing exam conducted so far. Informatics Assistant’s vacancy is declared for the fourth time. Informatics assistant is a post in the Department of IT & Communications(DOITC), Rajasthan. There has been three typing examinations before this time. IA Recruitment 2008: Conducted by the DOITC itself. IA Recruitment 2011: Conducted by the DOITC itself. IA Recruitment 2013: Conducted by the DOITC itself. IA Recruitment 2018: This time exam is going to be conducted by RSMSSB for the very first time. Let’s discuss the both patterns one by one. In this pattern a paragraph is shown on computer screen for typing. Candidate has to type the shown paragraph in the given text area just below the paragraph. (see the picture below). In IA Exam 2008 and IA Exam 2011 typing test pattern was paragraph wise. In this typing exam the typing test was line-wise. In line wise typing test a single line is shown on the computer screen and you have to type that given line in the typing area given below(see the following picture). Once you have typed the line you have to press “Enter” key on keyboard to go to the next line. When you press “Enter” key on keyboard next line is shown for typing. This is known as line wise typing pattern. This is the easiest typing pattern because you don’t miss any line untyped. In paragraph based typing test many candidates mistakenly miss one or two lines without typing. This is not the case in line wise pattern. The same line wise typing test exam pattern was also used in RPSC LDC typing test exam 2017. These were the two previous typing exams held in Rajasthan with same typing exam pattern. What will be the typing test pattern in Informatics Assistant exam 2018? Keeping in mind the last typing exam for IA 2013 and RPSC LDC 2017 there is extremely high possibility that the typing exam for IA 2018 will also be line wise. In 2013 IA typing exam was conducted by DOITC with the help of private agency. After four years the same agency was hired to conduct the RPSC LDC exam 2017; note that this time RPSC hired the same agency not DOITC. The reason behind line wise pattern is easy pattern and transparent results without any court disputes and high success rate. Which typing pattern should I learn? You don’t need to learn any pattern at all. You need to learn just typing only. If you know typing with required minimum speed for any exam you can pass the exam easily. In case of Informatics Assistant you have to type with speed of 20 words per minute in both Hindi and English. What about the typing software? Soni Typing tutor is the best choice for this because Soni Typing Tutor lets you to take test with both pattern. Soni Typing tutor has a special version only designed for Informatics assistant typing exam. It has both paragraph based typing and line wise typing test. User can take a test in any pattern according to his/her choice. You will get more than 300 exercises in this typing tutor which is more than enough. Typing test matter is also easy to difficult level. Typing software makes you confident about your preparation and save your time. 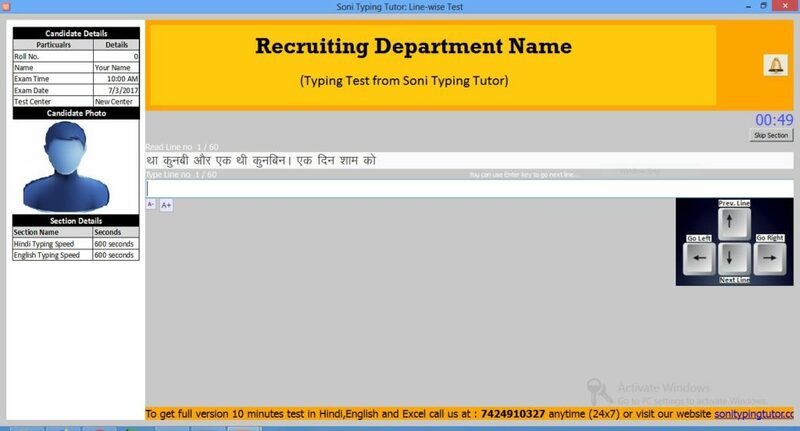 You can download the Soni Typing Tutor for IA exam from the following link. Hope this post gave you the desired information you were searching for. If you have any queries related to IA typing exam please ask us in comments section below. Best typing software. This is same as last time exam. Thanks for this. kitne din mein hindi ki typing seekh jayenge.. Ten days are enough to learn typing in Hindi and English separately. If you practice regularly you can achieve the desired speed for IA exam in 20 days minimum. In IA exam you need speed just 20 words per minute only which is not that hard to reach.